26 cm ca. 144 p.. : chiefly ill.
"Pride and Prejudice and Zombies" - a fiendishly clever mash-up of Jane Austen's beloved classic with all-new scenes of zombie mayhem - is "A New York Times" bestseller and a major pop culture phenomenon. This graphic novel adaptation, featuring all-original art, will bring this sensational tale to a whole new audience. 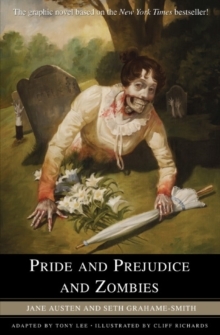 'It is a truth universally acknowledged that a zombie in possession of brains must be in want of more brains'. So begins "Pride and Prejudice and Zombies" - Jane Austen's immortal classic, now brought to glorious, gory new life with original, all-new scenes of zombie mayhem. Seth Grahame-Smith's irreverent and witty reworking of this novel immediately struck a nerve: The book quickly became "A New York Times" bestseller - and one of the most buzzworthy and blogged-about pop culture sensations of the year. Now "Pride and Prejudice and Zombies" is a graphic novel - the perfect format to bring this remixed masterpiece to zombie-loving pop-culture fans.